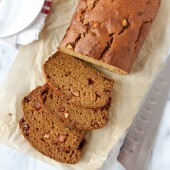 Moist spiced pumpkin bread with tender apples throughout. A perfect loaf for breakfast, snack or dessert! Preheat oven to 350°F. Lightly grease a 9x5-inch loaf pan with baking spray, or fit with parchment paper. Set aside. In the bowl of a stand mixer, cream together sugars and butter until light and fluffy. Beat in eggs, followed by pumpkin. Mix in remaining dry ingredients, beating until no streaks remain. Peel and chop apples into 1/2-inch chunks, stir into batter by hand. Transfer batter to prepared loaf pan. Bake for 60-65 minutes or until internal temperature reaches 190°F. Allow to cool in pan for 5-10 minutes before turning out onto a wire rack. Slice and enjoy. Store remaining bread in an airtight container for up to a week. Serves roughly 9, yields 1: 9-inch loaf.